What an incredible ’80s cruise! Rick Springfield as the host and a long list of performers, such as Thomas Dolby, Loverboy, Mike+ The Mechanics, Lou Gramm from Foreigner, Terri Nunn from Berlin, Billy Ocean and Tommy Tutone. But sitting home watching a video of my favorite rock star performing on a cruise ship in the middle of the ocean the same night it was happening? No way, not in my wildest dreams. I’m sure there were many more highlights from people who were actually there so check out the Facebook fan pages. If I can find any videos to share from YouTube, I’ll post at a later date. Next year’s lineup looks fun, too, especially the English Beat. I was a big fan in high school and I saw them once in this little bar in Tempe where I danced on the same dance floor as Dave Wakeling. 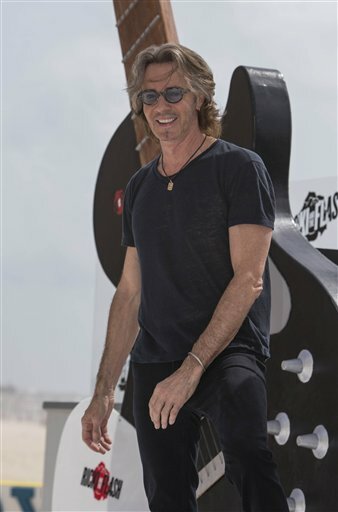 But this year’s cruise, with Rick Springfield as host, would be hard to beat. I never started playing the lottery so I never won and therefore am not going on the cruise, but hopefully some of the lucky fans who are will share some videos. Tonight RS is performing in Florida and then the ship sets sail on Saturday. Sometimes I feel like I know WAY too much about RS’s life. My brain can only hold so much information and I wonder sometimes if I didn’t know so much RS trivia maybe I’d remember more of my passwords and not have to reset them so often. There weren’t as many passwords to remember back in the 1980s. In fact, so many things have changed since then. My childhood mall is being redeveloped into an office complex. Toys R Us is closing all its stores. I feel like I’ve reached that age where I spend too much time explaining to my kids how things used to be and talking about things that no longer exist. Although the details are different, it’s a reiteration of my dad’s story about being one of the first families on his block to get a color TV. For some reason, today when people call me on my cell phone, I can’t hear them and they can’t hear me. To paraphrase Blondie, “Call me, call me any, anytime” but I won’t be able to hear you. For that reason, it sounds so fun to get way from all of this and go out on a big boat dedicated to the 1980s and all that great music. To everyone who is going – have an awesome time. Totally. For sure. My bedroom wall in the 1980s. Do the students at Santa Monica High School realize how awesome it is that they will be performing in a concert at their school tonight with Rick Springfield? I bet some of their mothers do. Tonight is the Greg Coote Concert For The Arts, a fundraiser for the Santa Monica – Malibu Education Foundation that helps support arts programs throughout the district. The concert will be held in Barnum Hall, a 1,200-seat theater that was built in 1937 and renovated in 2004. Many die-hard Rick Springfield fans likely attended school events in that building back in the 1980s and would have been shocked that their favorite rock star would someday be performing with the school’s students. I’ve recently been listening to the audiobook version of “Real Artists Don’t Starve” by Jeff Goins on the solo rides of my daily commute for school drop-off and pick-up. One chapter talks about Michelangelo’s apprenticeship under his mentor Domenico Ghirlandalo and about the idea of learning from a master in whatever field you’re interested in going into. Naturally, listening to this story led to a daydream about studying songwriting from someone I consider a songwriting master – RS. How cool would it be to spend some time in The Black Lagoon (RS’s home studio) to watch the birth of a song? He says he wrote “The Snake King” in one weekend so maybe he could offer songwriting sessions that could culminate in recording a new song. I’ll just send that request out into the universe in the hopes of it materializing someday. Hey, it could happen. After all, there was probably at least one student sitting in the ’80s Santa Monica High School Barnum Hall wishing she was watching her favorite rock star play on that stage. Note from the next day: I just found out that Terri Nunn, the lead singer of Berlin who performed at the concert, is an alumna of Santa Monica High School. How cool is that? !